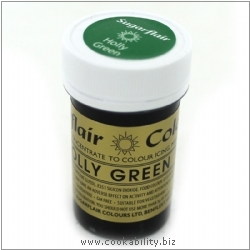 Sugarflair have over 30 years experience supplying the highest quality food colour to the sugarcraft industry. Shades can be achieved by varying the amount added. These colours will deepen a little overnight. This range is free from nuts, fat, gluten and GM. The colours used comply with the EC Commission Directive 95/45EC. Ingredients: Vegetable Glycerine, Mono Propylene Glycol, Silicon Dioxide, E133, E155, E102.